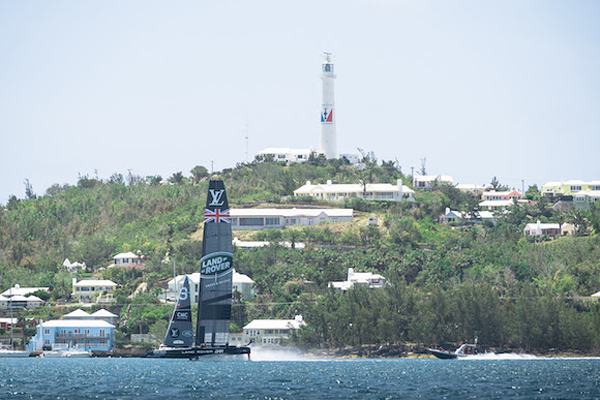 Six months after returning to the UK from Bermuda – where the team were based for the 35th America’s Cup – Land Rover BAR are now sharing their learnings and achievements in the Bermuda Sustainability Report, saying that “large sporting events present a unique opportunity to leave a lasting legacy and a positive impact in the communities where they are hosted. The report covers the activities undertaken in preparation for and during the team’s relocation to the island at the end of 2016, through to their return home to Portsmouth in July 2017, and has been created in collaboration with the team’s Exclusive Sustainability Partner, 11th Hour Racing. “Land Rover BAR was publicly launched in June 2014, with the goal to win the America’s Cup alongside becoming one of the most sustainable sports teams in the world. In these three years the team have scored many firsts, one of which was to become the first professional sports team in the UK to construct and operate from a BREEAM excellent standard building,” the team said. “The team was determined to have as minimal an operational impact on Bermuda as possible, through extensive resource planning of the team base and featuring modular design for easy and low waste construction and deconstruction; to create a space that would need to function as a VIP hospitality lounge, a specialist manufacturing facility, a training set-up for the sailing team, a design office and a public interactive exploration zone. The team’s Sustainability Manager, Amy Munro, was particularly focused on finding useful reuse options within the local community and charities, or effective recycling when the team left the island. “In collaboration with 11th Hour Racing, the team designed and built the ’11th Hour Racing Exploration Zone’ within the base. 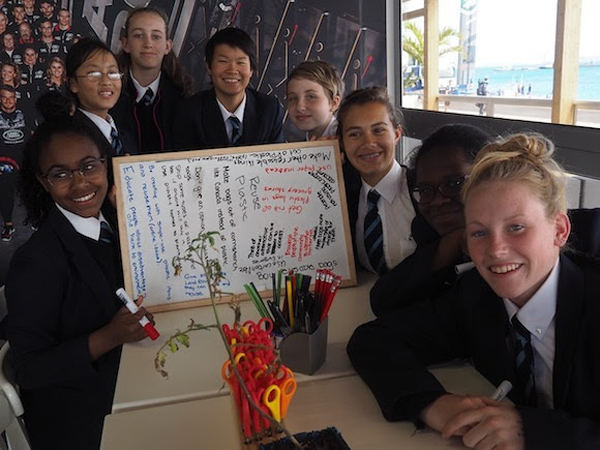 From the opening of the Zone in early February 2017, to the end of the America’s Cup in July, 9,708 visitors came through the education space with 1,800 Bermudian students taking part in lessons on ocean plastics, renewable energy and invasive species. “The Zone gave visitors unique behind-the-scenes access to the team. Eleven interactive exhibits created an engaging story with interconnecting themes including Technology and Innovation, Alternative Materials, Invasive Species/Lionfish, Ocean Plastics, The New Plastics Economy and Creative Solutions. “A permanent installation was also left on the island. 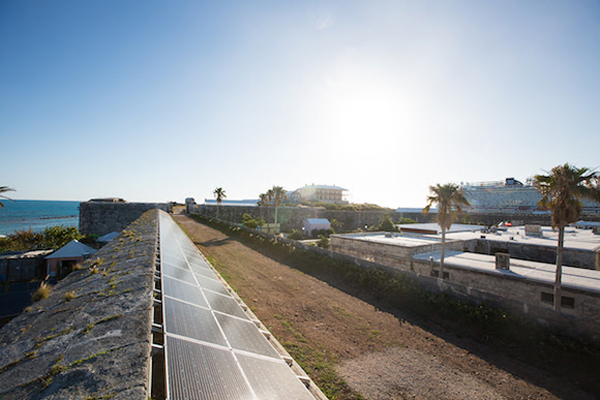 194 solar panels with support from the team’s Renewable Energy Partner, Low Carbon, and the Stempel Foundation, were installed at the National Museum of Bermuda. “The panels will generate more than 93,600kWh of clean energy, saving 43 tonnes of CO2 per year, compensating for the team’s energy footprint in Bermuda within two yearsand continuing to provide power to the island for a minimum of 30 years. 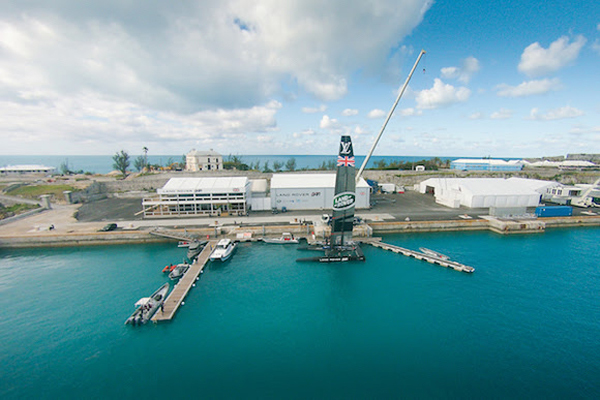 Land Rover BAR Team Principal and Skipper, Ben Ainslie commented on the team’s sustainability ethos: “We have seen how the power of sport can effect social change. Sport is now powerful enough to have the same positive impact on environmental issues. “At Land Rover BAR we are committed to working with partners like 11th Hour Racing to join the movement, influence behaviour and effect positive environmental change. “Our sporting goal is to bring the America’s Cup home to Britain for the first time, but we also extend far beyond the racecourse by committing to education, and inspiring younger generations. The team added, “All the team’s partners play a critical role in supporting the team’s sustainability goals. Ahead of the 35th America’s Cup, five behaviours were identified as having key impacts on climate change. “Land Rover BAR encouraged partners to focus on each of the 5 behaviours during the 5 weeks of racing. Over 10,770 people were engaged around the following topics; eliminating single use plastics, recycling unwanted materials, going meat free on Mondays, promoting and using renewable energy and only consuming sustainable seafood. 11th Hour Racing is the team’s Exclusive Sustainably Partner. Co-Founder of 11th Hour Racing, President of The Schmidt Family Foundation and Co-Founder of Schmidt Ocean Institute, Wendy Schmidt, commented on their continued support of the team, “Ben Ainslie and Land Rover BAR are demonstrating outstanding leadership using the platform of their visibility and sport to make the case for renewable energy, healthy oceans and ecosystems as part of a winning strategy. Yes indeed…I personally wish to see pubs and marine sores around each and every harbour…with a marine boardwalk wide enough to support commerce, docking facilities and warfage for international boating to facilitate water tourism. This reflects that sport and sustainability can create good partnerships. A win for the National Museum with the solar panel installation and for all the students who enjoyed the interactive learning environment. Hopefully this will ensure that any world class sporting events we host in the future have similar good outcomes socially and environmentally.